Folder icons in Windows have progressed since the old days but are still, more or less, the same vanilla we have been seeing for over a decade. 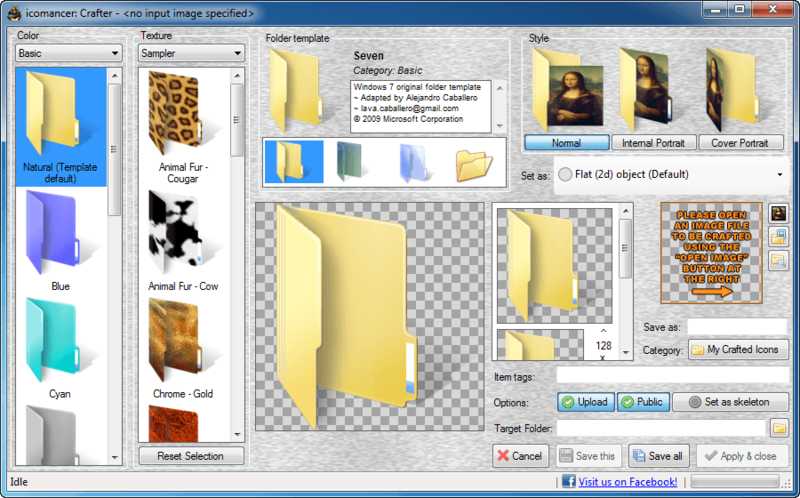 Ever had the desire to customize your folder and shortcut icons with colors, textures, or even your own images? Icomancer does that. Let’s see if it is worth your time. 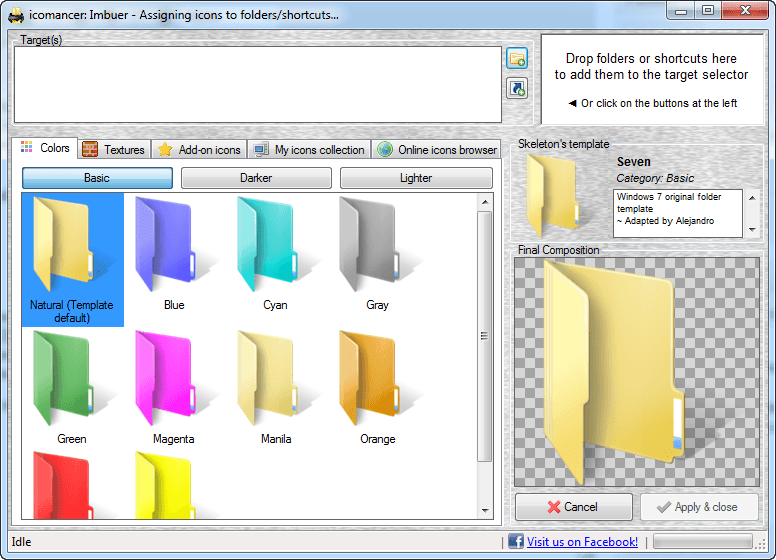 Icomancer is a program that allows you to easily customize folder icons and shortcut icons using colors, textures, “addon” icons, or your own images. You can also change a folder icon to reflect the style of a different version of Windows (e.g. Windows XP users can apply Windows 7 folder icons and vice versa). Take note by using Icomancer to customize the icon of a folder, you will lose the folder preview ability of Windows — the feature that shows you a preview of the contents of a folder in the folder icon. This is not an issue with Icomancer itself but rather the nature of modifying folder icons. Also take note Icomancer has free and paid versions. There is no difference in features between the free and paid versions but if you opt for the paid version, then you have access to download “premium” icon packs. 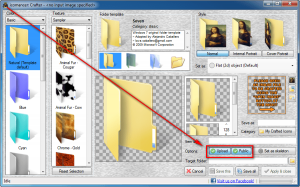 Allows users to modify folder icons or shortcut icons using colors, textures, “addon” icons, or your own custom icons you create from within the program (see screenshot to right for more detail). Note: All the colors, textures, and addons shown in the screenshot above are available in the free version. Premium icon packs are extra that you must download. Adds a white outline to icons on Windows XP; this does not happen on Windows 7 and, while I didn’t test it on Vista or Win8, my guess is it doesn’t happen on Win8 and Vista either (see screenshot to right for more detail). Note: Even though Icomancer will install ImageMagick for you if you don’t have it, Icomancer will not uninstall ImageMagick when/if you uninstall Icomancer. You will need to manually uninstall ImageMagick, if it comes to that. Note: Although after installation it asks you to restart your computer, I was able to use Icomancer just fine without restarting. I’d still suggest you restart, though, since the program wants you to. You must register an account to use Icomancer. Registration is free or you can opt to login via Facebook. By default when you create your own custom icon, the icon is uploaded to Icomancer servers and shared with others. You need to make sure to uncheck “Upload” and “Public” when creating your own icons to prevent this. The entry in the right-click context menu of “Imbue icon to folder from my icomancer collection…” is extremely long and makes right-click context menus unnecessarily wide. There is no ability to remove this right-click context menu entry. 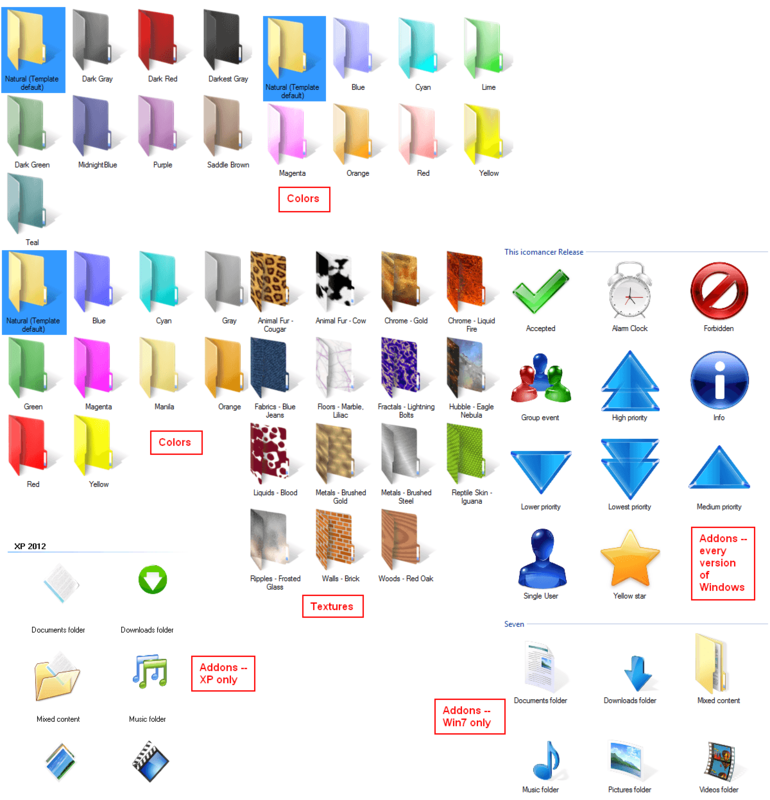 Icomancer is a program that allows you to customize the icon for folders and shortcuts. The program comes with a handful of colors, textures, and addon icons you can apply to your folders/shortcuts and you have the ability to create and apply your own icons using your own images and a combination of color/texture, if desired. 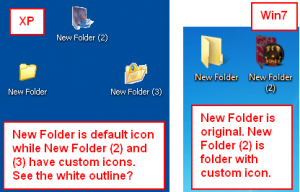 When creating a custom icon, you can also pick which style of folder you want — Windows 7, Windows Vista, or Windows XP. 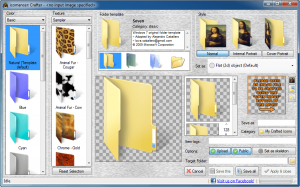 Craft is the feature that allows you to create your own custom icons using your own images and/or the provided colors, textures, and Win7/Vista/XP folder types. One important thing to note here is by default Craft is set to upload your custom icons to the Icomancer community database. If you don’t want Craft to do this, you need to make sure to uncheck the “Upload” and “Public” buttons. Embody is like Imbue except with Embody you drag + drop an image or ICO file and Embody customizes the icon of the parent folder that holds that image/ICO with that image/ICO. 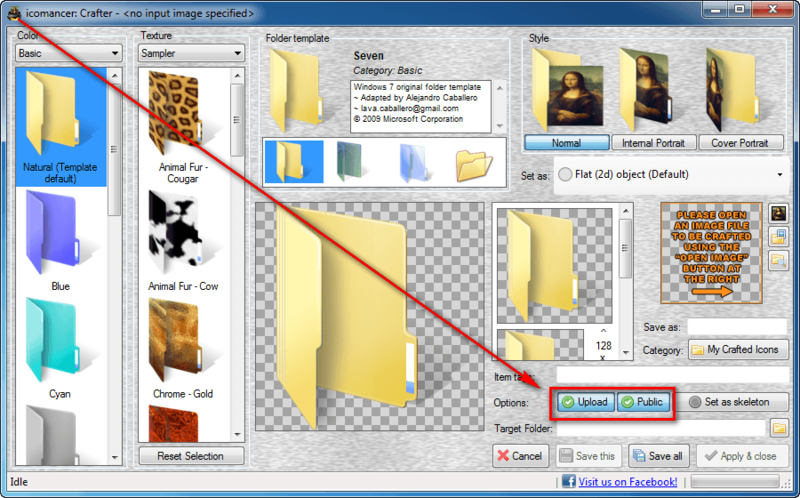 In other words, it creates a custom icon out of the image/ICO you selected and applies that icon to the parent folder. It is basically Craft + Imbue in one step. Copy allows you to save ICO or PNG files inside your own Icomancer database so you can use it on folders as desired. Aside from the terrible user-interface, Icomancer actually works pretty well. It allows you to customize folder icons easily, and the fact that there is a community database from where you can download free icons is a huge plus. My two favorite features of Icomancer is that it allows you to use your own images for icons and the fact that all folder icon changes remain even if you copy + paste a folder to another Windows computer or put the folder on a USB drive, external hard drive, etc. Well, it works well as long as you aren’t on Windows XP. For some odd reason, Icomancer adds a white outline to icons on Windows XP. This does not happen on Windows 7, and I didn’t test Icomancer on Vista and Win 8 but I’m guessing it doesn’t happen on Vista and Win8 either. I’m not sure why this happens; all I can tell you is it happens… or at least it happened during my tests of Icomancer on a XP SP3 machine. Icomancer has a terrible user-interface but it is a delightful program for those that want to customize the icons of folders or shortcuts. And the fact that it is freeware makes it even better. If you are on Vista, Windows 7, or Windows 8 and you need or want to be able to customize the icons of folders or shortcuts, then check out Icomancer. If you are on Windows XP, unfortunately that white outline bug kills the program for you so I’d recommend staying away. You can, however, check out Folderico  which provides some, but not all, of the same features as Icomancer.